It hasn’t arrive yet, but one of my sisters friends purchased one of these, And I absolutely loved it. The vibrant colors, the quality, the texture. I will update my review once mine arrives. Nourison Baja Reversible Yellow Area Rug - 6'6" x 9'6"
Marvelous ikat medallions with zig-zag edges create the dynamic tribal pattern of this Moroccan influenced area rug. 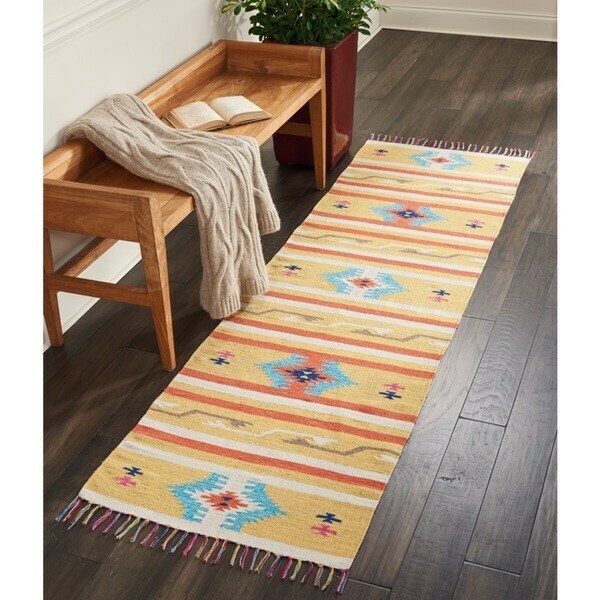 Part of the Baja Collection, it is handsomely woven in flat-weave, kilim style of pure, natural cotton fibers. Stunning in a color medley of tangerine and turquoise on ivory and grey; finely fringed; and reversible for extra wear. Nice quality rug but the colors were too bring compared to the picture. Expect these rugs to be about half as light as they look in the pics. Also the returns are not easy (I have to find and drive to a UPS store) and cost about 10%-15% precent of what you paid for the item. I probably won't be ordering any more items through Overstock. Great rug for the money, looks great in a hallway, colors are vibrant! nice lightweight runner. goes well in front of my sofa.